Just a quick share today of some more thank-you cards I made for the baby shower. These go together really easily and you can feel so artistic mixing colors! The stamp set is a retiring favorite I've told you about before...Work of Art. I love it for simple cards like this and there's really nothing else in the catalog like it! 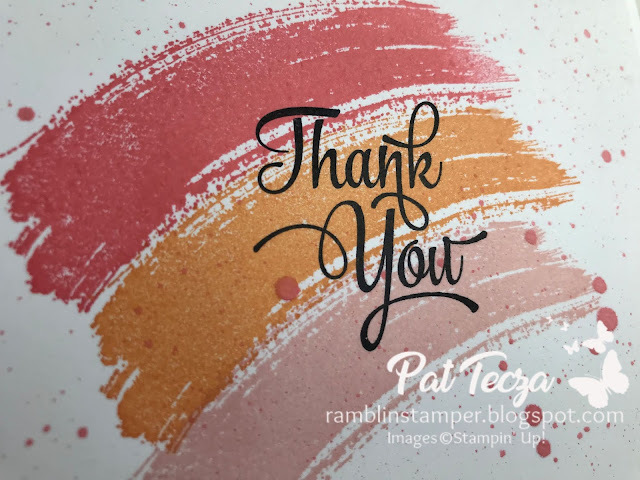 The "thank you" comes from One Big Meaning, which is also on the retiring list, but if you're like me you have lots of choices when it comes to "thank you" stamps. 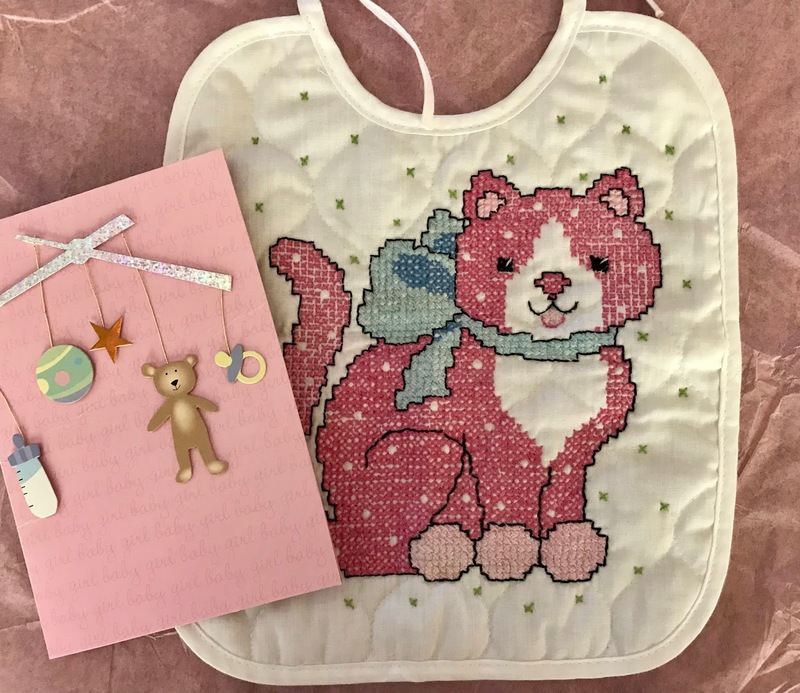 You can make these in a rainbow of colors...so much fun to mix & match! 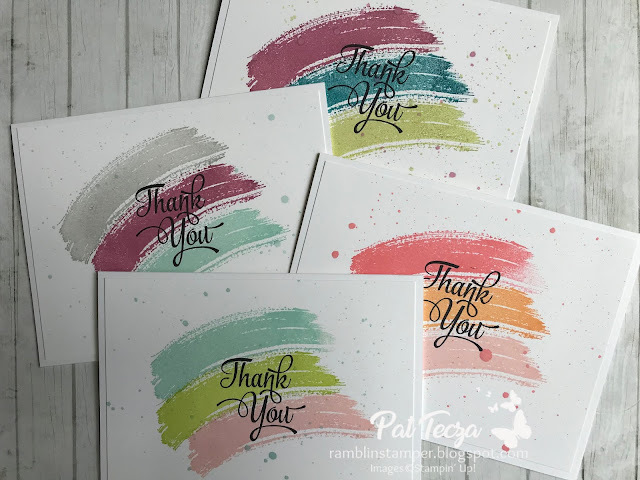 Add a drop of ink to the inside of the lid of your same color stamp pad. Using a water-filled Aqua Painter, swirl it around in the ink to fill the brush with ink. Using a craft knife (or a pallet knife or butter knife, whatever you have), draw the bristles toward you and let the ink splatter onto the cardstock. Less water on the brush will give you smaller splats - more water makes them larger. As always with a new technique, practice on a piece of scrap paper until you are confident! And do be sure to protect your work surface from errant splatters! Just a gentle reminder...after Thursday some of these products are no longer available through Stampin' Up. Click any of the links at the end of this post to purchase now! This week I received a surprise in the mail from one of my customers in Iowa. 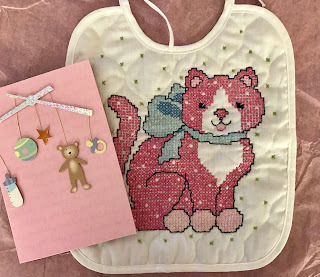 This lovely lady sent me a beautiful cross-stitched bib for my baby granddaughter! Stampers are the nicest, most thoughtful people. Thank you, Jackie!